Reactivated STEREOMUD, featuring LOVE SAID NO singer Erik Rogers, has finished recording two new songs entitled "Burn" and "Skeletons". Both tracks will be posted online within the next week and one of the songs will be made available for free download. STEREOMUD was an alternative-metal-hard rock band based out of Georgia and New York. The group released its first album, "Perfect Self", on Columbia Records in 2001 and a video for the song "Pain" received airplay on MTV2. The LP went on to sell more than 200,000 copies and hit #5 on Billboard's Heatseekers chart upon its release in May 2001. The lead single, "Pain", peaked at #8 on the Mainstream Rock chart, and "Steppin' Away" entered the Top 30 on the same chart, taking the album to 142 on The Billboard 200 list. STEREOMUD's "End of Everything" landed a spot on the WWF "Forceable Entry" compilation album released by the World Wrestling Federation in 2002. Other bands on the CD included DISTURBED, KID ROCK, ROB ZOMBIE, CREED, SEVENDUST and DROWNING POOL. STEREOMUD returned two years later with the second effort, "Every Given Moment", which matched its predecessor's Billboard chart position and spawned the Active Rock Top 30 hit single, "Breathing". In April 2003, Columbia Records cut the band's tour support and dropped the band, leading to the band's split in July 2003, a mere three months after the release of "Every Given Moment". 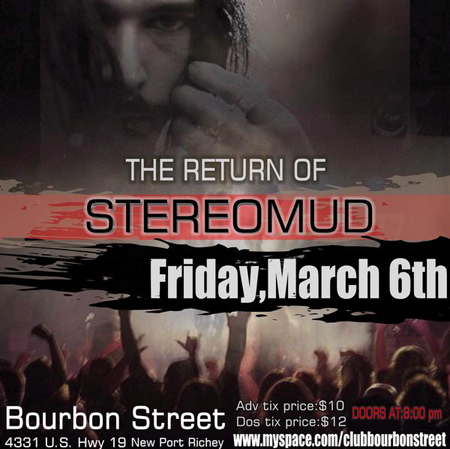 In addition to Rogers, STEREOMUD's original lineup included bassist Corey Lowery (ex-STUCK MOJO, currently in DARK NEW DAY), guitarist Joey Z. (LIFE OF AGONY), drummer Dan Richardson (ex-PRO-PAIN, CRUMBSUCKERS) and guitarist John Fattoruso (BLACK WATER RISING). For more information, visit www.myspace.com/officialstereomud.